of Podiatric Medicine in 1990.
years of residency. During that time, he participated in the Baja Project for crippled children, giving care and treatment to children in the northern part of Mexico. of the American College of Foot and Ankle Surgeons. He enjoys all aspects of podiatry and treats all age groups. 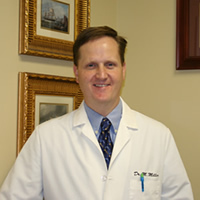 Dr. Miller met his wife Cherie in High School and have four children who are all involved in lacrosse, soccer and gymnastics.